The Greater Springfield Convention and Visitors Bureau	provides visitor information and services. 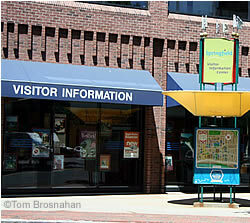 The GSCVB operates a handy Visitor Information office on Main Street right in the center of Springfield (map). If you stop here, be sure to pick up a copy of the free Discovery Tour map of Sprihgfield showing all the things to see and do. The Chamber's activities and membership cover the entire Pioneer Valley, so go to their website for information on accommodations, events and more.